When done well, indirect lending can be an important and profitable source of growth for your auto portfolio. 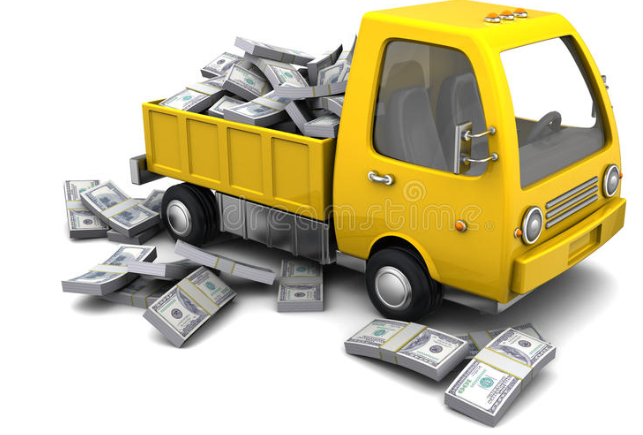 However, if done improperly, you might wind up making more truck loans, without the corresponding truckload of money you think they are delivering. Without proper oversight, indirect lending can have tight margins due to higher risk borrowers and charge-off normally associated with that portfolio. Dealer fees and a lack of non-interest income opportunities from GAP, extended warranties, and credit insurance add to the tightening interest margins. Therefore, it is imperative that the indirect portfolio be monitored closely. Both the finance team and the lending team must work in tandem to ensure that the portfolio is performing as expected. The table below shows how thin the actual margins can be for an indirect loan and the table assumes the loan goes to the full 48-month term. We all know that a loan seldom goes full term and loans generally are in your portfolio for less than 36 months – meaning margins are reduced even further than shown below. 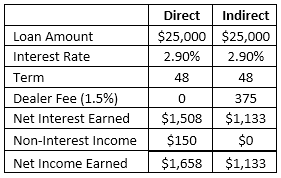 As you can see, even without considering higher charge-off or delinquency rates normally associated with indirect loans, the direct loan, with a small amount of non-interest income earns 46% more than the indirect loan. One way to consider indirect lending is as a complement to the standard direct lending portfolio. It’s nice to have if it’s profitable, but think about if your level of reliance on that portfolio is sustainable for your long-term vehicle lending growth. In the vehicle financing transaction the dealers also need to earn a profit margin from your members. It is important to consider what the dealer earns and what you need to earn to determine if the program generates sufficient return. And then there’s the age-old question of whether credit unions can turn an indirect member into a real member. According to Credit Union Times, only a few indirect members use credit unions for additional services and they tend to depart once the loan is paid, but that doesn’t mean you shouldn’t make the effort to build a relationship. We suggest you view every funded indirect loan as an opportunity to call that member to capture additional business. Don’t market the checking account, that borrower has a checking account, your initial effort should be to establish both a personal relationship and a deeper lending relationship with that member. Refinance other loans you find on the credit report you already have or get them into a credit card. Establishing the personal connection through direct communication gives the borrower a reason to consider you for more business. Those direct communications create more opportunity and build relationships, and as relationships are built over a period of time you will increase income. If you choose indirect lending as your primary source of vehicle loan business, a well-managed indirect portfolio can create income that is normally greater than what you might earn if you invested the same funds elsewhere. An Article by NCUA recommends that credit unions monitor indirect portfolios risk using multi-dimensional portfolio analysis and static-pool analysis, profitability, loan-to-value concentrations, portfolio changes over time, and determination of vehicle value. If you don’t know whether your indirect portfolio is both successful and is meeting NCUA recommendations, we can help you make those determinations. If you have an indirect portfolio, you should also make efforts to have a robust direct loan portfolio. Those are your members and the meat and potatoes of your consumer loan portfolio. I can hear you saying “But direct lending is difficult!” – I venture to say it is not. Market to your members so they know what you offer. Establish constant vehicle loan recapture programs. Have a marketing hook that generates interest in borrowing with your credit union. Have great staff taking the applications and serving the members. Spend some time focusing on your direct loan portfolio and you should see results. 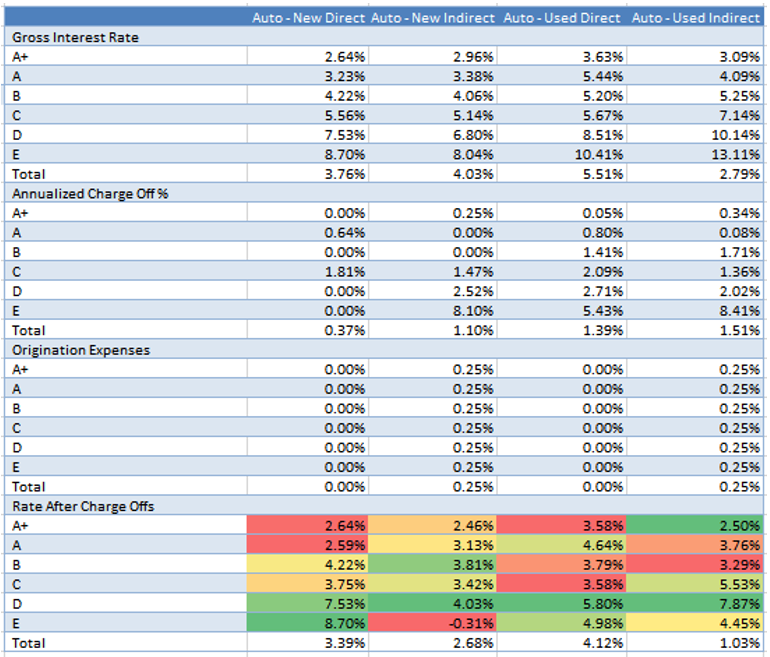 Below is an example of how Twenty Twenty Analytics can help you determine profitability for your indirect loan portfolio. With your given interest rate and charge off data, we can analyze which loan segments and credit tiers offer the greatest yield. We can also help you determine performance for individual dealers, provide peer performance data, vehicle valuations, and loan-to-value data so you have all the tools to manage your portfolio. To learn more about 2020 Analytics and how we can help you understand your indirect portfolio feel free to reach out and we would be glad answer all of your questions.